The little kitty takes a Holiday vacation with all the Sanrio characters you know and love in tow. Hello Kitty might be even more popular now than she was back in the '80s now that I think about it. You pretty much see her everywhere you go; she's on tees, bookbags, all manner of stationary, toys- and now the Nintendo 3DS. Hello Kitty Picnic with Sanrio Friends invites players to join Hello Kitty and Sanrio friends as they prepare for a picnic adventure. Play 10 mini-games including Hidden Object, Spot the Difference, and Picnic Blanket Checkers to collect goodies for the party. Explore and decorate whimsical environments including Hello Kitty’s bedroom, kitchen and more. 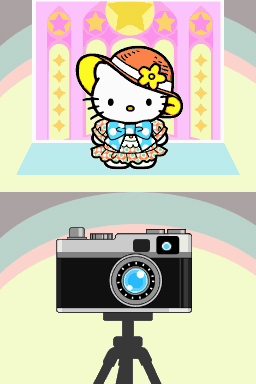 Along the way earn apples to receive special outfits and accessories for Hello Kitty. Interact directly with Hello Kitty using the 3DS touch screen and listen as the game guides you along. Invite your friends to join the fun in a variety of multiplayer modes as you play with your favorite Sanrio characters including My Melody®, Keroppi®, Chococat®, Badtz-Maru®, Little Twin Stars®, and many more! The game is expected to hit the handheld gaming console this Holiday Season- just in time to make it onto wish lists everywhere. Note for Hello-heads and Kitty Maniacs: There are no screens to show yet, the pic above is from Majesco's (the same publisher behind Picnic) Nintendo DS Hello Kitty title Hello Kitty Party.